I think I need to start thinking about my enemies. What types there are, what behaviour they have, how it related to their theme and level. What weapons they use, what abilities they have. How strong, fast, etc. they are. Basically, all the things design. At worst, I want to make some prototype ones and implement all the needed features in parallel. I don’t know what sort of theme my game will have. I’ve been thinking about it a lot and I have a few ideas from abstract to fully arted. 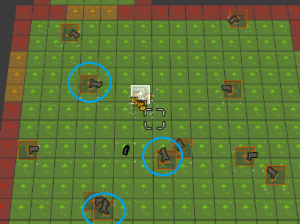 My current plan is to have a bunch of modular robots as enemies. Mainly, because the art should then be easier: less organic, more blocky, simpler on any rotation/direction, fairly reusable and made of parts, especially for bosses. 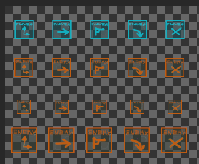 I can then make mob entities from “parts” and even use that for gameplay and procedural visuals. We’ll see how it goes as I add a bunch of programmer art meanwhile. And this now keeps the enemies with machine guns firing in full automatic for a longer period (theoretically, ~4 times longer, but other factors kick in, so it’s more like 3-4 times longer). 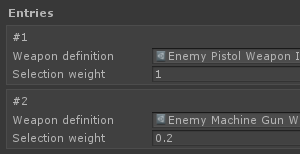 I’m going to add enemy shotgun too. And then wonder how I am going to balance it all. At some point, this will need a whole lot of playtesting. 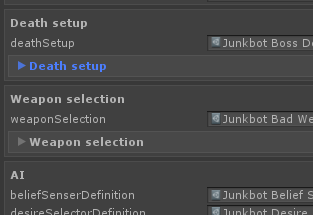 I this point, I need to clean up my enemy definitions and level themes and related assets. 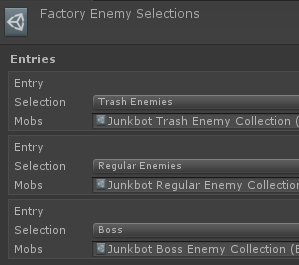 Firstly, I will just define my current scope as a “factory” level and al; enemies as variation of a “junkbot”. Both are non-specific (don’t have actual design or direction; yet) but also specific (have a name instead of “default” or “generic”) descriptors. 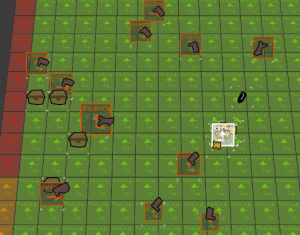 So the player cannot pick up these anymore (maroon-gray is enemy, gray is player). Anyway, this about does it for various enemy things I need to do. Mostly it was just getting it ready for big changes that I will cover in future posts.